Once the customer has been selected, a web-only draft will be created. If a previous draft has already been created, it can be loaded or discarded to create a new order. Fill in order details. Use the Refresh Totals button to display the order total. New items can be added to the order using the Search For Item field. Remove the line by pressing the delete button (X). 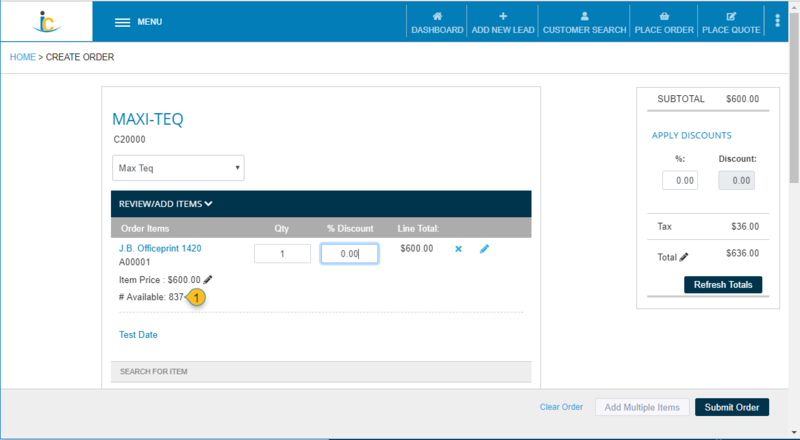 If enabled, the Sales User may apply discounts to the existing price, either by placing a percent discount in the % Discount field or by editing the Item Price field. Negative discounts are not permitted. If enabled, Line Notes can be added to a line. Finally, order header information such as addresses and shipping method must be applied. Fill in order details and press Refresh Totals to calculate the order prior to submission to B1. Note: Note that discounts must be non-negative. That is, if you try to increase the price above the assigned price, it will use the assigned price instead of the higher amount. 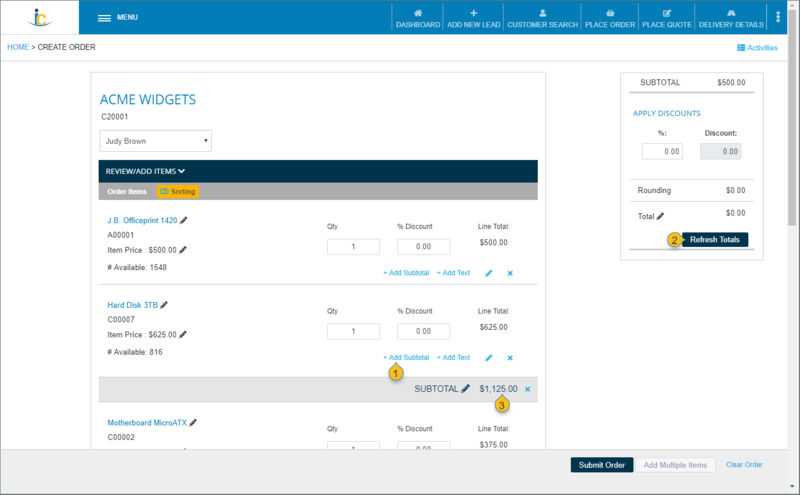 To increase the default price for a customer, work with your admin team to assign the customer a different price list or price in SAP Business One. 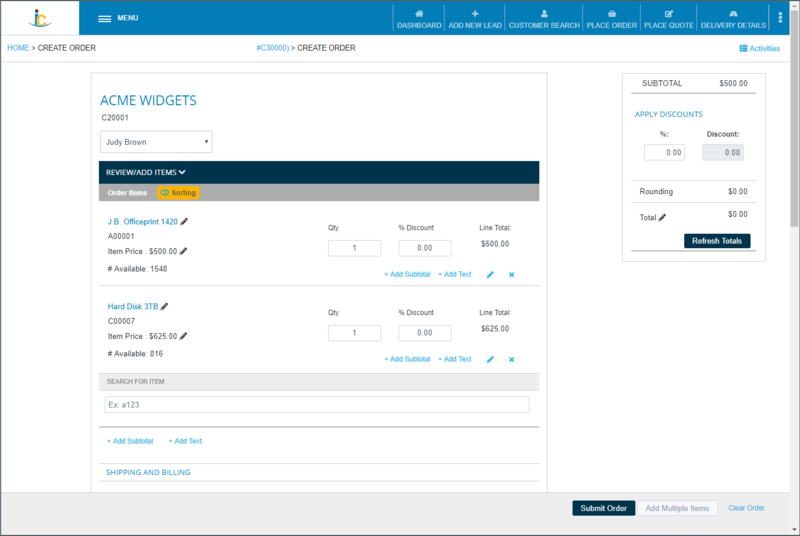 If successful, the order will be submitted to SAP Business One and the order confirmation screen (shown below) will be displayed. When the order is submitted, this confirmation screen will be displayed. See Signature Capture for a walkthrough. See Refill Order for a walkthrough. Available To Promise allows Sales Users to see available stock quantities on Order Pad. If configured, ATP will be displayed at time of order (1). See Available To Promise Setup for configuration instructions.